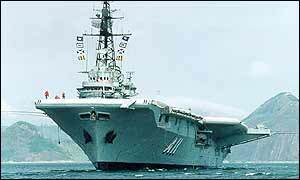 The aircraft carrier has spent 60 years off Brazil. A scheme to house the World War Two aircraft carrier HMS Vengeance at Devonport has failed because the naval base does not have room. The vessel was built in Portsmouth but has spent the last six decades anchored off Brazil. In September this year it was bought by a British man who expressed interest in relocating it to Devon. Business leaders expressed disappointment at the news. Tim Jones of the Devon and Cornwall Business Council (DCBC) said the ship could have been turned into a floating hotel or conference facility. He described the news as a blow for business and tourism in Devon. DCBC also said that proposals to house the carrier in Torbay are also unachievable because of a shortage of funds. Negotiations are now underway for the National Maritime Museum in Falmouth to take the vessel, a bid which would be helped by Cornwall's Objective One status.